“It’s a very good feeling, when it all comes together like this,” summed up Embassy Racing team owner Jonathan France, at the conclusion of a highly satisfactory Tourist Trophy meeting at Silverstone. 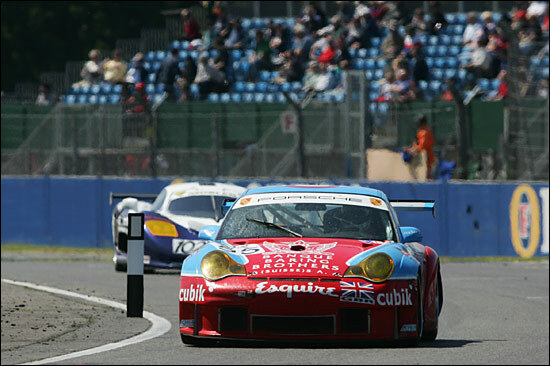 His team had just made its 2005 FIA GT debut (having reluctantly taken the decision not to race at the previous round at Magny-Cours), and Ben Collins and Neil Cunningham had brought the team’s Porsche 911 GT3-RSR home second in the GT2 Class. It wasn’t a completely straightforward race, but as GT racing goes, it was relatively straightforward – if a little nerve-wracking towards the end. 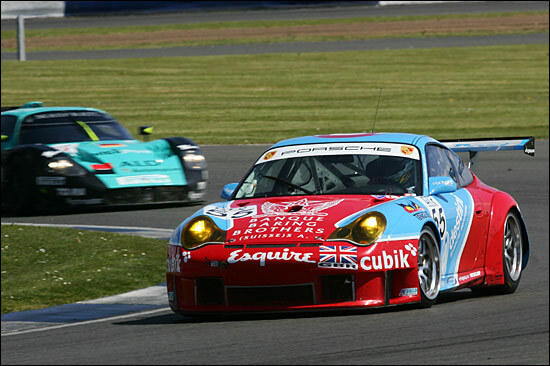 In free practice on Friday, the distinctive pale blue and red Porsche was consistently third fastest in class – behind the two factory-supported GruppeM cars. The challenge was to get the Embassy machine as close as possible to the #66 and #88 cars. 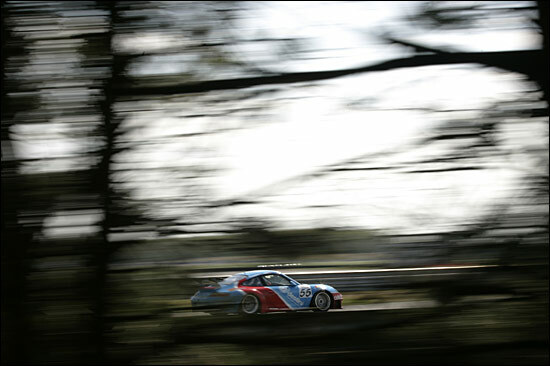 At the conclusion of Saturday morning’s first qualifying session, Ben Collins was a little disappointed at the gap – as well as the fact that the Embassy Porsche was now sitting in fourth in GT2, behind the Team LNT TVR. So was it better in the afternoon? Both Ben and Neil were full of praise for Embassy’s race engineer Geoff Kingston, a man with years of experience at this sort of thing – getting a car spot on. 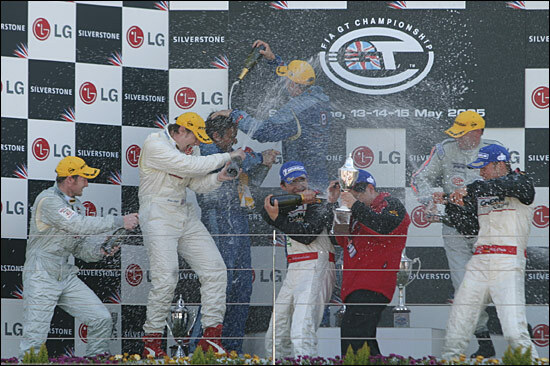 Geoff is more than a race engineer though, having had responsibility for the complete design of GT cars in the past. The Sunday morning race warm-up was an early session – too early for Ben Collins. “I was still in bed. Neil did the session, and all he did was ‘take the tops off some new tyres’ for me.” He scrubbed in new rubber in other words. Times were completely irrelevant – so the fact that Neil was slowest of all the cars in the field meant absolutely nothing at all. It was Neil Cunningham to start the race – an early one, at 10.15 on Sunday morning. Now it was getting to the really serious part, Collins and Cunningham get on superbly together, as drivers as well as mates, but now it was time to get down to it. Neil ran fourth in class early on – “You made a cracking start,” commented Ben – and initially sat behind the TVR, of Jonny Kane. Then the fun started. 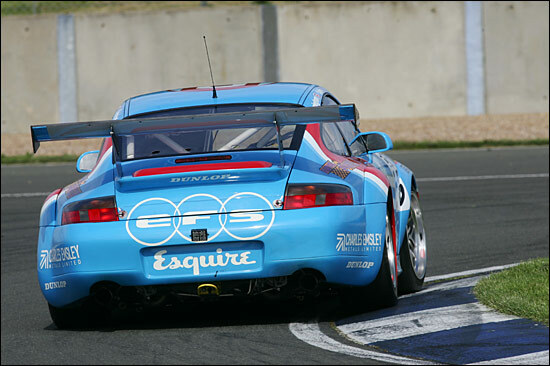 After a battle like that, it was a relief to see the Embassy Porsche get ahead of the TVR (on lap eight) – which then slipped away and eventually into the pits with a puncture. No problems at all though for the #55 car, which Neil just got on and drove, hard, as he occupied a secure third place in class, behind the two GruppeM cars. 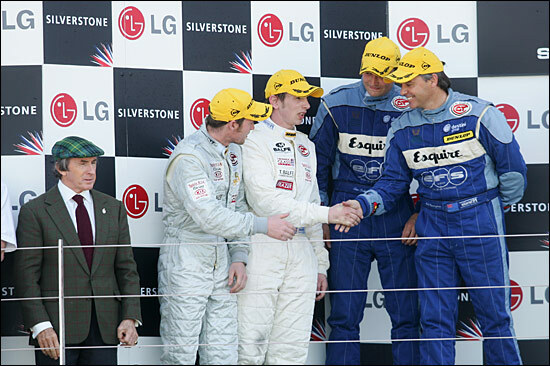 His stint lasted until the fifty-first lap, at which point he dived in for a full service, and for Ben to take over. Eight laps later, Ben Collins was back in – and thee mchanics were desperately searching for a problem at the front left corner of the car. And that, almost, was the only problem incurred throughout the three hour race. Ben held his hand up to a drive-through penalty – “I didn’t switch the engine off quickly enough, and the guys began refuelling me before I had switched off”. That was at Ben’s final refuelling stop (at which point he stayed in the car for the relatively short stint to the finish), but before long, second place in GT2 was secure, the #88 GruppeM Porsche having lost several laps with a water leak. “That’s why we chose to run a Porsche,” concluded Jonathan France. That turned out to be a very good decision. 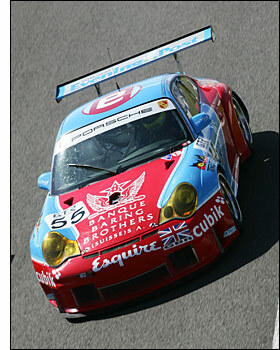 Next event for the team is within the next few days: the British GT races at Knockhill in Scotland (May 21-22). 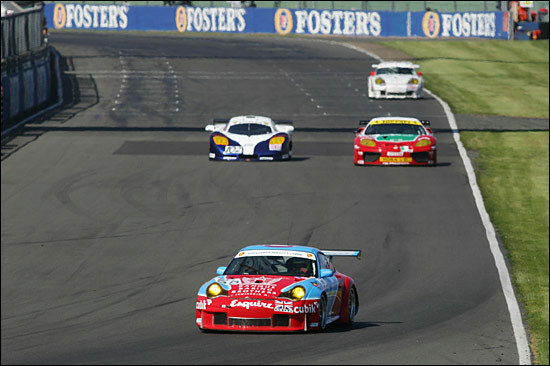 That’s the main target now – getting on terms with the Ferraris in the British series. 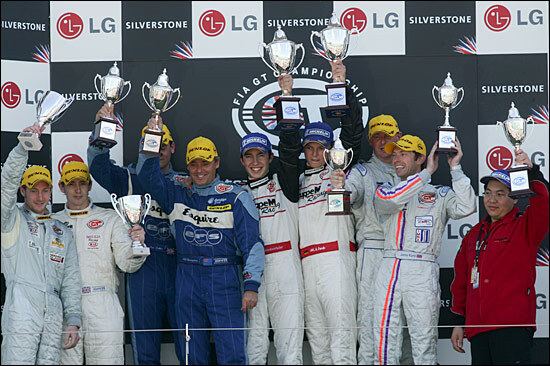 Notice a very famous Scot on the podium, with the Balfe Motorsport drivers, plus Ben and Neil.